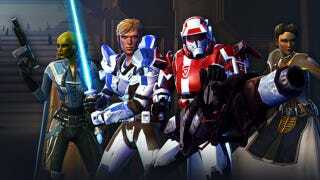 Which Class Should I Play in the Star Wars: The Old Republic Beta? That's right; less than a month before the start of early access and I've finally made it into the beta test for Star Wars: The Old Republic. That leave me a weekend to learn all I can about one character class. The question is, which one? I'm pretty sure which class I'm going to focus on when The Old Republic launches next month, so I'll leave it to you folks to determine which one I'll be slipping into over the next couple of days. Just hit up the poll below and cast your vote. Polling ends at 10PM Eastern, after which I'll scan the results and create a character worthy of being Kotaku's emissary to the Empire or the Republic. Which Class Should Fahey Play in The Old Republic Beta?